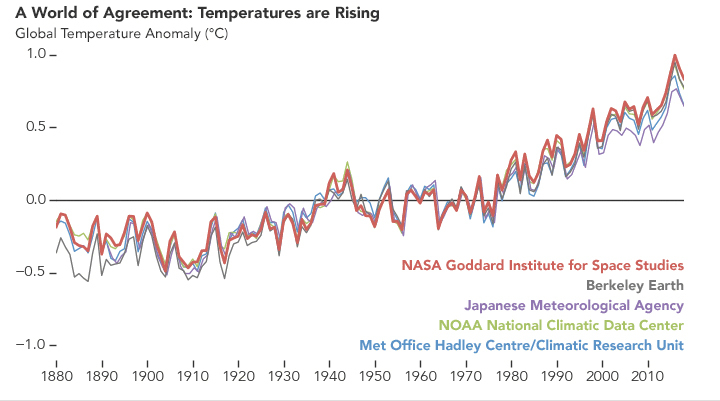 Temperature data showing rapid warming in the past few decades, the latest data going up to 2018. According to NASA data, 2016 was the warmest year since 1880, continuing a long-term trend of rising global temperatures. The 10 warmest years in the 139-year record all have occurred since 2005, with the five warmest years being the five most recent years. Credit: NASA's Earth Observatory. Download still image. *Technically, a “consensus” is a general agreement of opinion, but the scientific method steers us away from this to an objective framework. In science, facts or observations are explained by a hypothesis (a statement of a possible explanation for some natural phenomenon), which can then be tested and retested until it is refuted (or disproved).